Although Druids are believed to have existed throughout Celtic societies in Europe during the Iron Age, almost all the surviving evidence about them is found in the writings of later Roman authors. Julius Caesar wrote one of the first, and most detailed, accounts of Druids, explaining that along with the “knights” they were the highest-ranking orders in Gallic societies. He said they were “engaged in things sacred” but Druids also appeared to function as judges, as they decreed “rewards and punishments” if there were murders or disputes over boundaries or inheritance. Although they worshipped nature, Caesar claimed that Druids made human sacrifices to appease the gods including burning people to death inside “figures of vast size”, a ritual depicted vividly in the classic horror film, The Wicker Man. Tacitus claimed the altars of Druids in Anglesey were “drenched with the blood of prisoners” while other Roman authors told how they sacrificed white bulls in groves formed of oak trees. Pliny described Druids as “magicians” who wore white robes and used golden sickles to cut mistletoe, a sacred plant which they believed had healing powers. This description lives on in the figure of Getafix, the Druid in the Asterix books. Druidry was suppressed during the Roman occupation but interest in it was revived in the 18th century as the ancient stone circles at Avebury and Stonehenge – which actually pre-date Druids – were examined properly for the first time. 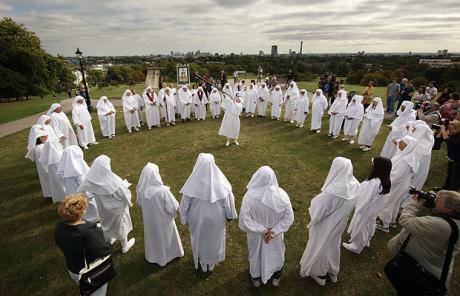 Followers began to hold ceremonies known as “gorsedd”, where bards would gather on hills or sacred mounds, with the first held at Primrose Hill in 1792. These events continue, particularly at the Eisteddfod celebration of traditional Welsh culture where the Archbishop of Canterbury, Dr Rowan Williams, and the former Chief Constable of North Wales, Richard Brunstrom, have both been inducted as honorary Druids and given Bardic names. 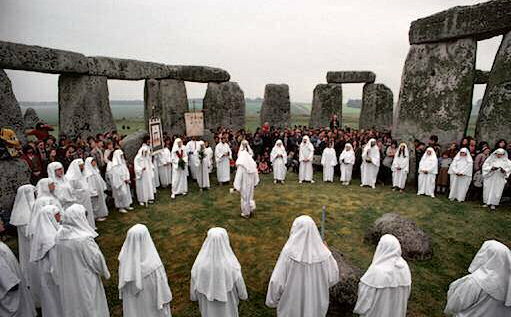 Druids hold festivals eight times a year to mark stages in the solar and lunar cycles. 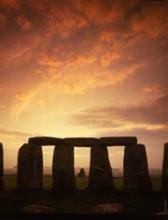 At the summer solstice, Druids gather at Stonehenge to greet the dawn. One of the best-known modern Druids, who has often led protests against restricted access to the site, is a former soldier who changed his name to King Arthur Pendragon.